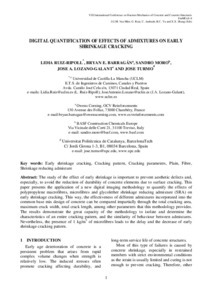 The study of the effect of early shrinkage is important to prevent aesthetic defects and, especially, to avoid the reduction of durability of concrete elements due to surface cracking. This paper presents the application of a new digital imaging methodology to quantify the effects of polypropylene macrofibres, microfibres and glycolether shrinkage reducing admixture (SRA) on early shrinkage cracking. This way, the effectiveness of different admixtures incorporated into the common base mix design of concrete can be compared impartially through the total cracking area, maximum crack width, total crack length, among other parameters that this methodology provides. The results demonstrate the great capacity of the methodology to isolate and determine the characteristics of an entire cracking pattern, and the similarity of behaviour between admixtures. Nevertheless, the presence of 1 kg/m3 of microfibres leads to the delay and the decrease of early shrinkage cracking pattern. The study of the effect of early shrinkage is important to prevent aesthetic defects and, especially, to avoid the reduction of durability of concrete elements due to surface cracking. This paper presents the application of a new digital imaging methodology to quantify the effects of polypropylene macrofibres, microfibres and glycolether shrinkage reducing admixture (SRA) on early shrinkage cracking. This way, the effectiveness of different admixtures incorporated into the common base mix design of concrete can be compared impartially through the total cracking area, maximum crack width, total crack length, among other parameters that this methodology provides. The results demonstrate the great capacity of the methodology to isolate and determine the characteristics of an entire cracking pattern, and the similarity of behaviour between admixtures. Nevertheless, the presence of 1 kg/m3 of microfibres leads to the delay and the decrease of early shrinkage cracking pattern. Ruiz-Ripoll, L. [et al.]. Digital quantification of effects of admixtures on early shrinkage cracking. A: International Conference on Fracture Mechanics of Concrete and Concrete Structures. "Proceedings of the 8th International Conference on Fracture Mechanics of Concrete and Concrete Structures". Toledo: 2013, p. 758-762.